1-1/2" and smaller Rope Sockets have a grooveless basket design for use with resin or zinc socketing media. 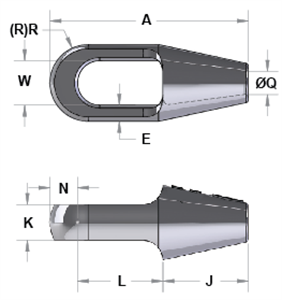 Specially designed retaining segments preventing rotation and pop-out of socketing compound. 1-1/2" and smaller Rope Sockets and all Strand Sockets feature these retaining segments. All dimensions are subject to tolerance.